VIENTIANE, LAO PEOPLE’S DEMOCRATIC REPUBLIC (3 April 2019) — Economic growth in the Lao People’s Democratic Republic (Lao PDR) is expected to remain stable this year and next, supported by the expanding agriculture, energy, industry, and services sectors, says a new Asian Development Bank (ADB) report. 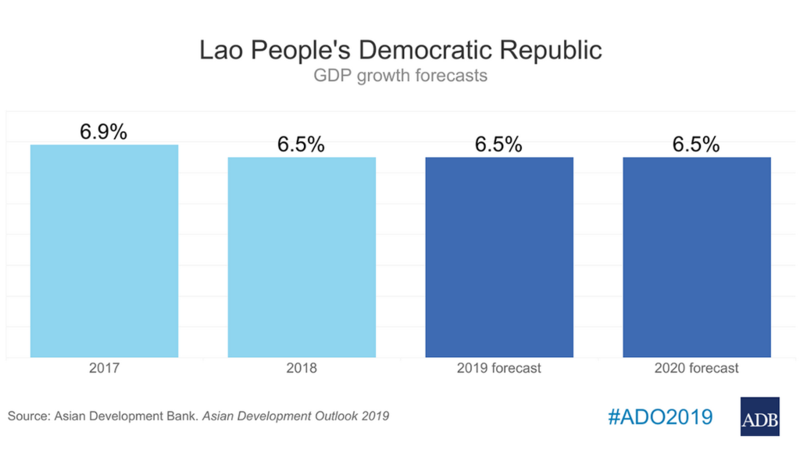 The Asian Development Outlook (ADO) 2019 forecasts Lao PDR’s gross domestic product (GDP) growth to remain at 6.5% in both 2019 and 2020. Industrial growth is forecast to edge up slightly to 8.1% in 2019 from 8.0% in 2018, largely because of sustained infrastructure development and an increase in electricity generation. The agriculture sector is expected to expand by 2.5% in 2019 and 2020, and the services sector is expected to grow by 6.7%, thanks to the government’s effort this year to attract tourists from the People’s Republic of China and neighboring countries. Inflation is forecast to remain at 2.0% in both 2019 and 2020, as global oil prices are expected to be lower than 2018 and food prices to remain subdued due to the recovery in agriculture production. The current account deficit is expected to widen to 9.5% of GDP in 2019 and 10% in 2020. Electricity exports will edge up this year, thanks to new generating capacity, which will help push up the volume of the country’s exports by 12% in US dollar terms both in 2019 and 2020. Meanwhile, import growth will accelerate by 13.5% this year and 12% in 2020 to support more projects in hydropower, expressway, and rail. International reserves are forecast to fall, to just under $1 billion in 2019, which will cover 1.3 months of imports. Risks remain, including an uncertain global trading environment. Meanwhile, the potential worsening of the country’s fragile external payments position is a major domestic risk, as well as the threat of natural disasters. ADB is committed to achieving a prosperous, inclusive, resilient, and sustainable Asia and the Pacific, while sustaining its efforts to eradicate extreme poverty. In 2018, it made commitments of new loans and grants amounting to $21.6 billion. Established in 1966, it is owned by 68 members—49 from the region.